After my pasta-making extravaganza this morning, I spent all afternoon wondering what sort of sauce I should serve the raviolis with. 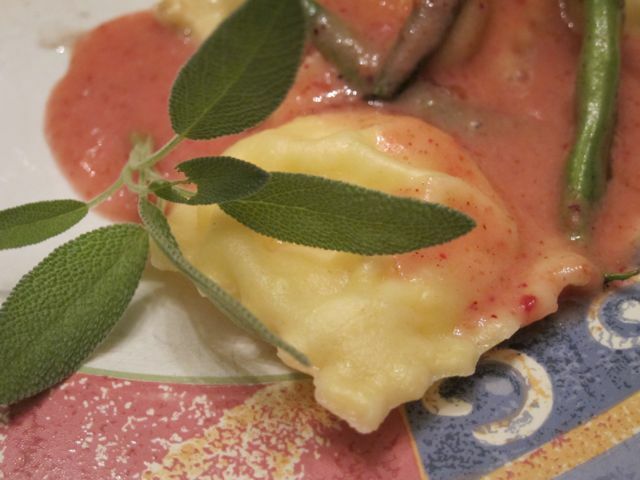 I mean, here are these wonderfully fresh pumpkin-sage raviolis. A brown butter and sage sauce might be too much sage, right? The first 5 ingredients were pureed in the blender and then the brown butter was added with the blender on low. I set this aside while I cooked the raviolis and the rest of the homemade spaghetti. In the pan in which I'd browned the butter I cooked all the little green beans from my bean plant. The bean plant was brought to me at the end of kindergarten by my 6 year old who was excited last week to see that it was huge and had lots of little beans on it. I think they were supposed to be kidney beans, but as they were all so tiny, I figured we could just eat them. Once they were sauteed, I put them on the ravioli and topped it all with the cranberry sauce and a sprig of sage from the garden. Wow.